Last week, we were a bit short on news items for Sheep Droppings and threatened to go to a bi-weekly schedule. But this week was a big week for sheep, so we're back for our third consecutive week. The "Call for Calls for Papers" for the planned #GEO/CODE symposium at the 2013 AAG meetings in LA went out last week. We hope to get a diverse group of folks working on issues around the geoweb and big data to participate, so if you'd like to help organize a session or participate in some way, please get in touch! One of our co-organizers for the symposium, Ryan Burns from the University of Washington, has a short blogpost up illuminating some potential lines for a geographic critique of 'big data'. Also check out the new Digital Natives With a Cause? Newsletter from the Centre for Internet and Society, in which Mark has a blurb. There was also this little map last week, which ended up getting picked up by The Guardian, The Atlantic Cities, FlowingData, and io9 among other places. 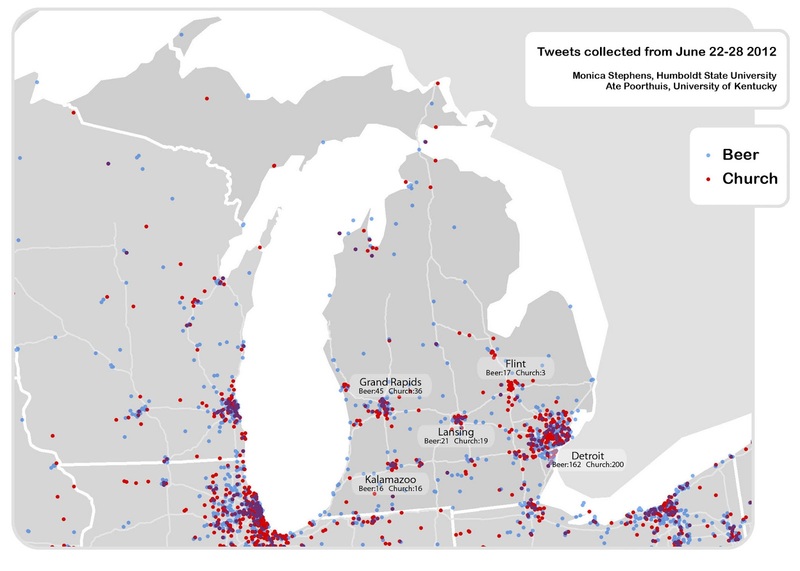 There was even this more localized map of Michigan published on Michigan Live. Thanks to everyone for reading, sharing, liking, re-tweeting, what-have-you, and welcome to our new fans and followers who discovered us through the map. And the Church vs. Beer map also just happened to overshadow Mark and Monica's cartogram on the geography of Twitter, which was also featured on The Atlantic earlier in the week. Mark has continued exploring the world of zombie-themed augmented reality apps, and Matt also came across another example of zombies being used as a teaching tool, this time at Michigan State. It's nice (and perhaps a bit worrisome) to know we're not alone in our fascination with the undead.